First posted 5th December, 2010 on Liquorature. Some rums just upend all expectations, and maybe even redefine your assumptions. 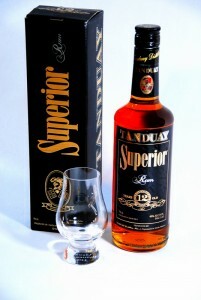 Smooth, amber-dark, just sweet enough, and with a body and a finish that simply don’t give up, Tanduay Superior 12 year old is like that. Where on earth has this rum been, and why can’t I find it in Calgary? A very affable individual from my office named Rainerio was heading off home to the Phillipines the other day, and knowing there were interesting rums to be found there (though unashamedly confessing ignorance of exactly which ones those were since I had never had any) I went down on bended knee, indulged myself in a paroxysm of weeping meant to soften any stony heart, and begged him to bring back a sample for me to review. Well, I exaggerate a bit for poetic effect, but I did ask. And Rainerio very kindly brought me back a bottle of this stunning 12 year old. Hell I would have been satisfied with any local popskull, and to get something so all-round excellent was a like getting an early Christmas present. 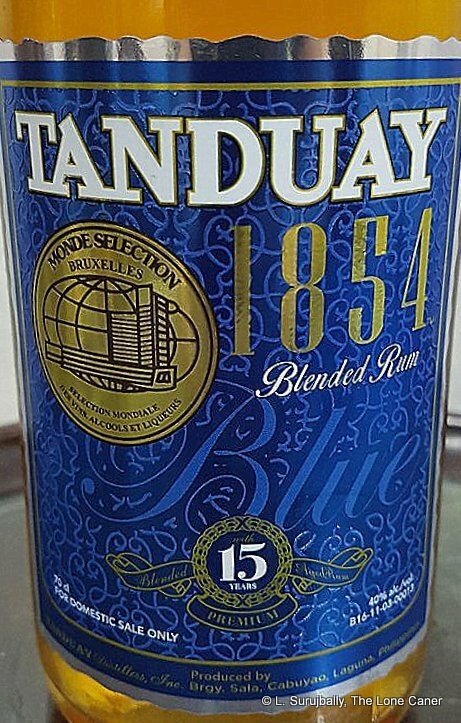 Tanduay is one of the most popular, if not the most popular, make of rum in the east, particularly the Phillipines, and made by the Tanduay Distillery out of Manila. Like other major distillers – Bacardi and Diageo come to mind – they have a complete range, from light to dark, from the very cheap to the very expensive, and they have been in operation since 1854, which pips Bacardi by, oh, seven years. Yet, for whatever reason – distributors ignorance, lack of channels, unfavourable tariffs or whatever, you really have to look around to find it in North America (my research suggests it may be more readily available in Europe) and yet it may be the third most popular brand of rums in the world. A dark brown rum of the same hue as the Bacardi 8 year old, the Tanduay 12 year old is an oak-aged product served up in a standard bottle emerging from a hard cardboard black box, and sporting a deceptive cheapo tinfoil cap. I looked askance at it and wondered whether this was a harbinger of things to come, but what the hell, I had asked for it and so dived right in. On the nose the 12 year was spicy and immediately assertive with equal parts vanilla, caramel and lemon zest in some kind of crazy harmony, as if Michael Jackson suddenly joined up with the Bee Gees and they created a song of their own that just missed being nuts by some strange unknown alchemy. It was bold and immediate, but after allowing it to breathe, a sly delicate note of flowers came stealing around the more powerful notes. Yes there was some sting, but this died away after a while and the medicinal reek I so dislike in younger rums was utterly absent. The rum took my hand and took me along with it: medium heavy body, coating the tongue with a sort of oiliness I have only had with DDL’s more aged rums. There was just enough sweet to the Tanduay, and the caramel and vanilla notes were now joined by something softer, perhaps bananas or a tamed light citrus. It slides smoothly down the throat and let me tell you, the fade is simply awesome. Long and smooth, with one last soft gasp of breathy fragrance wafting back up to remind you of what you just had, and inviting you to revisit the experience with another try. Unless a distributor for this rum is found or whatever has stopped the importation of Tanduay to Canada is resolved, I doubt I’ll ever taste it again (though maybe I can ask Rainerio to bring another one back in a year or two). I’m glad I had a chance to try it: just when I thought I had a handle on the major brands of the world, this one came out of nowhere and smacked me upside the head. If nothing else, it says that though I may have tasted and reviewed more rums than most, there are always gems from other places previously unconsidered that will just amaze, delight and please with their overall excellence. This is the first one in my experience: I know there’ll be others, but Tanduay gives me hope that I’ll actually be able to find them, and share that delight with all those who one day read the reviews I put up about their quality.